As research for a panel on the subject of ‘audiences’ at the Radical Film Network‘s inaugural conference earlier this year, I spoke to a number of media organisers and radical filmmakers about their work and how they survive while doing it. This is the second of two interviews I’ve published (the other being last week’s with Franklin Lopezof subMedia.tv), with the intention of inspiring, comforting and galvanising those making political work and no money. Tim Hjersted is the co-founder and head of operations (note the lower case, not an official title) of political video site Films For Action. He and his colleagues have been collating and curating political films, images and articles for the last eight years, and at last count they had 400,000 followers on Facebook. What spurred you to start Films For Action? 95% of our funding comes from advertising on the site. The other 5% comes from donations, which we really never promote, but the support we get from people is definitely appreciated. We’d consider this independent because Google Adsense doesn’t care in any way what kind of content we promote, as long as it doesn’t violate their common-sense restrictions. Soon, we’ll be doing PPV (pay-per-view). Do you get any say in what Google advertises on your site or is it entirely random? We have the ability to block certain ads or ad accounts, which we do fairly often to keep the ad experience as classy as possible. This is a constant battle though as there are always new ads coming in and we only personally see a small portion of them in daily use of the site. Do you have another job/income source than Films For Action? No – after 7 years working on this without pay, FFA has finally become financially able to support myself full-time, as well as 2 part time staff. How many people work for/with Films For Action? We have 3 paid staff, 2 of whom are co-founders. We also have 2 other co-founders who currently aren’t active but were for the first several years. We also get a lot of help from our site members, who make submissions to the site. There’s Eli, who works part-time, maybe a third or fourth of the year, on back-end site coding and feature enhancements for the site. In September 2014, I hired a long-time contributing member of the site to do content curation (seeking out, reviewing, and publishing content on the site, then sharing it on Facebook). Andrew (Butler, who has just set up the Bristol chapter of FFA) lives in the UK and does 20 hours per month. We also have dozens of city chapters that operate independently from us, and each of those chapters has at least one chapter leader doing work locally. A lot of these chapters are at various levels of activity or inactivity. Do you consider Films For Action to be politically and/or aesthetically radical? Yes, politically, as in we try to seek out the root causes and the root solutions to society’s problems. Aesthetically we’ve designed the site to be appealing to a global, mass audience, without any obvious connotations (such as how many anarchist sites have a particular aesthetic which might turn off non-anarchists). Do you consider your way of organising radical? I’ve never thought of it is radical, but we’re certainly very different from conventional non-profits and media networks. Our organizing work might be considered anarchist in that we’ve pursued a DIY ethic from the beginning, not content that tries to persuade conventional media to change, or to get anyone else to try to solve these problems. We haven’t tried to appeal to any other non-profit groups, politicians or media to change. We recognized the problem and felt that the best approach would be to create a better media ourselves. The benefit of this is that it doesn’t require waiting on anyone or anything – hosting film screenings or creating a Facebook page or website is something anyone can do. We’ve also tried to model the kind of organizational values that we believe should be a part of ‘the new media.’ In our case, the people working on FFA have operated in a tribal, non-hierarchical fashion. While I’ve been considered the leader or project director for many years now, decisions are made collectively by the people involved. I’ve frequently deferred to others preferences when there is a disagreement on some aspect of making changes to the site, or occasionally, with content choices. I think the fact that our group started out among 4 close friends really helped us be productive and effective. We already shared a very similar political perspective, and we already got along really well. We each also had some expertise in a particular area. Because of this, we’ve avoided some of the pitfalls of groups which start out among a bunch of interested strangers who might show up to a public meeting to volunteer, and who may or may not have the relevant skills. What is your (brief) definition of ‘radical’, if you have one? To go to the root. To address root-causes. Do you find any conflict between the work you do and earning money from it? I used to share a commonly-held notion in our culture that any truly ‘good’ non-profit work should be done out of the goodness of your heart, but over the years I’ve come to see how this perspective is really problematic. Other activists fortunately helped me dispel this notion. Money in our society is an exchange of value, but presently our society holds entirely backwards notions of what is valuable in society. Sports players and movie stars may make millions of dollars, while teachers and social workers may barely make salaries above the poverty line. It doesn’t make sense to me that people doing some of the most important work in the world (including social change activists) should have to scrape by earning very little, while it is perfectly acceptable for people who work in the financial sector of our economy to produce nothing of any value for society but be making millions every year. What is interesting is that very few question the ethics of making money from being a doctor or stock trading or serving food, but there is this perceived conflict for those doing social change work. I had this notion stuck in my head too, until I had a hour-long conversation with an activist who called me from Australia. He really helped me to see the value of my work and that there was nothing wrong with being paid to do something that is helping other people. It was his opinion that activists deserve to be compensated for their work, a lot more so than a lot of the jobs that are highly compensated. This is something that I’ve also seen encountered frequently by documentary filmmakers. Because so many films are released for free, whenever a filmmaker isn’t financially able to do that and needs to charge people to see or buy the film, there are a lot of people that don’t really have any respect or understanding for the fact that filmmakers need to eat and make a living just like everyone else. Yes it’s certainly wonderful when a film can be released for free so that the film can reach a larger audience, but I think it’s unfair that filmmakers are expected to put so much work into their films but people balk when asked to pay to see it, because it’s in the social change category. Some filmmakers can afford to do it, some can’t. We should do our best to support the films that cost money, because for better or worse, money is one of those ways that we can show support for each other. It’s one of the ways that we give value to what people do. What contact do you have with your audience/viewers? We get lots of emails and Facebook messages. I also regularly read the comments we get on our Facebook posts. I try to respond to all our emails, and I reply a lot on our Facebook posts. It’s getting harder to respond though with the increasing volume of messages we get. Which medium do you find to be most useful in terms of creating an audience or community around Films For Action? Facebook. By far. It’s where 90% of our traffic comes from. Was there one piece of work or event that led your audience to grow, or has it been mostly gradual/organic? We’ve had several articles or videos go viral now, which gave us dramatic boosts in traffic a few times over the last 2 years. In between that it has been very gradual. We’ve been doing this for 8 years now and if you look at our growth curve the tail at the beginning is suppppperrr long. Things really only took off in the last 2 years. Do you dedicate time specifically to building your audience, or have you let it happen organically? Yeah, a little bit. Our main concern has been getting a high viewership for the content we share. This has meant optimizing the title and description of the videos to get a higher click-through and share rate. We’ve taken some lessons from Upworthy in this case, without going as far as they do. Sharing images has also been a good way to build our Facebook audience, more so than sharing links. If our traffic goes up, that generally ties directly to increasing our Facebook community, so we’ve generally just focused on finding the most important and meaningful content, packaging it as best as we can and then getting it out there. One interesting factoid is that 2/3 of our Facebook community is outside the US. This has made us focus on content that is relevant to people everywhere, not just the US. No, not really. We’d certainly prefer if there were alternatives that were as widely adopted as Facebook is, but right now, it’s just the nature of the situation. I’d rather see Facebook used for activist purposes and have some good come out of it then have it not used at all. If activists abandoned it, then it would just become even more entertainment and distraction-oriented and I don’t think that’d be any better. 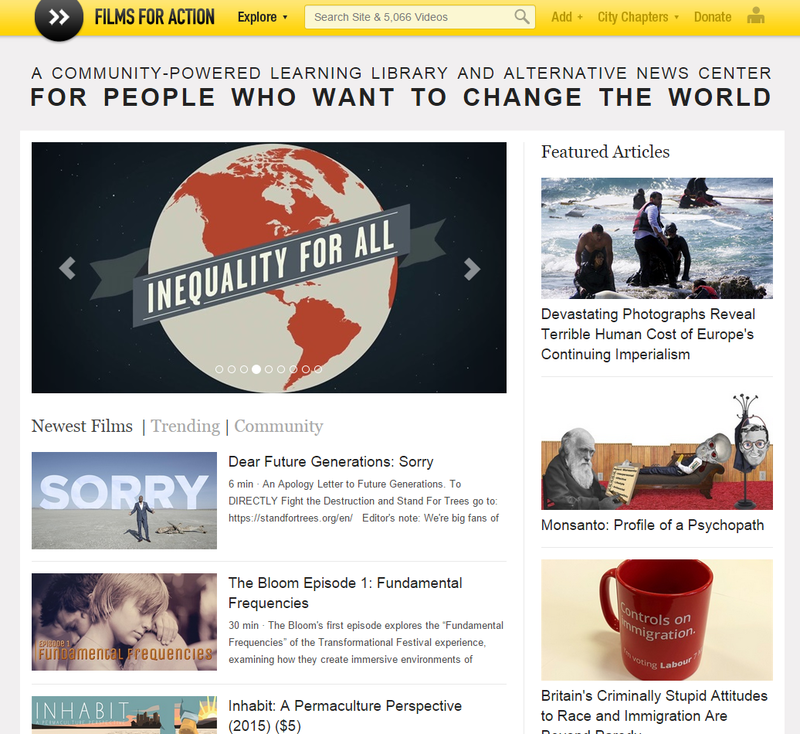 Follow @FilmsForAction on Twitter, and on Facebook, and watch and read their social change films atfilmsforaction.org. Elizabeth Mizon is a writer, filmmaker and organiser based in Bristol, UK, and recently finished her first feature documentary The Fourth Estate. Follow her @elizabethethird. A Crushing Attack on Equality: The Musical!